Dayton City Hall is located at 101 West Third Street, Dayton, OH 45402; phone: 937-333-3636. Photo: Nicholas Ohmer House, ca. 1864, 1350 Creighton Street, Dayton, OH. 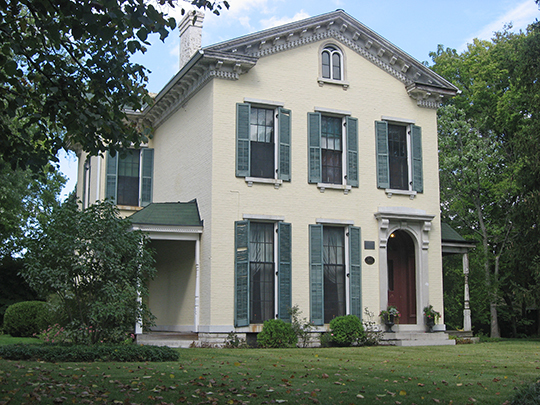 Listed on the National Register of Historic Places in 1974. Photographed by User:Nyttend (own work), 2011, [cc0-by-1.0 (creativecommons.org/publicdomain/zero/1.0/deed.en], via Wikimedia Commons, accessed May, 2014. General Jonathan Dayton, the city's namesake, was a distinguished lawyer, senator, and soldier of New Jersey. As a statesman he helped draw up the Constitution of the United States; as Speaker of the House and counselor in important litigation, he proved himself a master jurist; as officer under Lafayette, he served as a brave and distinguished soldier. General Anthony Wayne's victory over the Indians in 1784 made the settlement of the area safe and possible. In order to develop land over 5 million acres west of the original 13 colonies, the Ohio Land Company was formed in 1786. Active in the management of this enterprise was John Cleves Symmes of New Jersey. Symmes petitioned the U. S. Government for a grant of 2 million acres and began selling portions of the land before it was surveyed. The reason for the founding of Dayton was nothing more than the rich, black earth that crops out along the Miami River channel. Because of this fertile soil the grass was thicker here than elsewhere and the shrubs greener; because of this rich pasturage, large herds of buffaloes and elk roamed and grazed; because of the presence of the game, Indians came to hunt. Good hunting for the Indians was good hunting for the white man. Both wanted it and both wanted to keep it. The varying point of view between the whites and the Indians led, in time, to the valleys of the Miamis being known as the "Miami Slaughter House." In battle after battle, in skirmish after skirmish, the soil of southwestern Ohio was drenched with blood. Every surveyor who left the fort at Cincinnati for the trip up the valley, knew that in doing so he took his life in his hands. Probably the first white man to set foot on the soil of what became Dayton's Main Street was a French major named Celoron de Bienville, who ascended the Great Miami n 1751, and described the sight of 30 or 40 buffalo grazing at one time, knee deep in the tall grass on the river bottoms. Through various explorations the site of the confluence of the Miami and Mad rivers became increasingly desirable, and its notoriety spread. Surveying of the town did not take place until a treaty with the Indians was signed in 1795. In September Israel Ludlow laid out the streets, naming one after himself, and others after his colleagues, and it was he who named the town Dayton. Dayton did not begin to grow significantly until 1805 when land complications were virtually settled with the Indians. Mail had begun to be delivered a year earlier. Charlotte Reeve Conover, The Story of Dayton, The Greater Dayton Association, The Otternbein Press, Dayton, 1917.